An emotional Sen. John McCain (R-Ariz.) hugged son-in-law Ben Domenech and told him to “take care” of his daughter Meghan, The Arizona Republic reported. 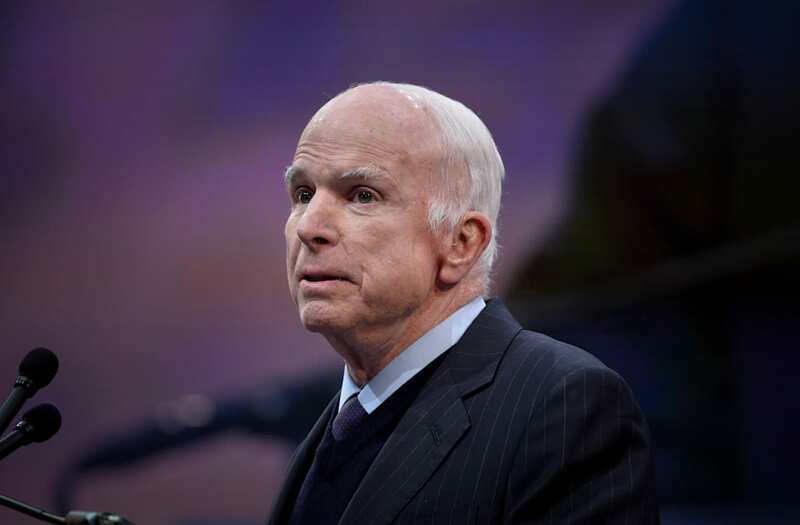 The six-term senator was released earlier this month from the Mayo Clinic in Rochester, Minnesota, following surgery for an intestinal infection. He is currently at his home near Sedona, his wife, Cindy, said in a tweet last Monday. Meghan McCain, co-host of ABC’s “The View,” said in a tweet earlier this month that she was traveling home to see her parents. She said on “The View” that she planned to fly back and forth from New York for a time. “So just know if I’m not here, I’m hanging out with my dad and my mom,” she said. Such a compelling few days on @TheView! I've really enjoyed it. I am going home to Arizona today to be with my family for the rest of the week but will return Monday. Thank you all again for your kind words and prayers for my father - it really means so much to my family. She recently posted a photo on Instagram, apparently from her wedding, with her dad. “Thank you for teaching me how to be a Viking warrior — even when some thought it more appropriate for boys,” she wrote. The maverick senator, who ran on the GOP ticket for president against Barack Obama in 2008, has been one of the few Republicans to speak out against Donald Trump. During his campaign, Trump took shots at McCain for being captured in North Vietnam and held as a prisoner of war for five years. “He’s not a war hero,” said Trump. “He was a war hero because he was captured. I like people who weren’t captured.” Trump received four student deferments from military service between 1964 and 1968. Ok one more. @senjohnmccain with me at our first Christmas as a married couple. @senjohnmccain @zelda.frenchie.1 and our two boys Jack and Jimmy enjoying the morning at the Navy Memorial. So many years ago. @meghanmccain @senjohnmccain at her Columbia University graduation. Last month, McCain said Trump’s very public announcement that he was pulling U.S. troops out of Syria “emboldened” president Bashar Assad just days before Assad was accused of launching a chemical attack on his people. McCain voted against his party’s bill to repeal and replace Obamacare last summer.